If you currently carbonate and store your homebrew in kegs, you can use a counter pressure filler to bottle beer directly from your kegs. One huge advantage of this method is that since you are bottling already carbonated, clear beer, there will be no sediment at the bottom of your bottles. Counter pressure bottle filling is how a brewery bottles beer. The bottle is under pressure while the carbonated beer flows in. Because the interior of the bottle is pressurized there is minimal loss of the CO2 in solution. The opposite of filling under pressure is when you pour a beer into a pint glass where CO2 erupts out of solution creating all that foam. Great in your glass but not good when you are trying to bottle carbonated beer. Our counter pressure filler mimics a single filling head on a professional bottling line, a concept that we all know works very, very well. Made by Fermentap, the design has two unique features. Number 1 it is the only model made entirely from stainless steel. Number 2 you flush and fill from the bottom of the bottle. I needed to get a C02 bottle filler and I've been looking at this one previously. The single swivel handle for gas and beer in stands this above other similar items I've seen elsewhere. Hope it works better than beer gun. If I bottle a sour beer can I boil the entire unit to santize it thoughly? Will the stopper withstand high heat as well as other parts? BEST ANSWER: You will want to dissemble the unit and soak in warm PBW or Alkaline Brewery Wash. Excellent quality and value no more flat beers! Works great it takes a couple of bottles to get the hang of it. Once you bottle 3 to 4 beers you get the concept. A key tip is to remember to shut off the beer side before capping. I did this and made a volcano mess out of one beer. Another helpful tip is if your going to bottle a large amount crank your co2 up 5 to 10 psi the night before. Start at the recommended psi settings in the instructions on the day of bottling. Cap on the foam, the foam should rise slowly, no volcanoes. From there can find your sweet spot psi without wasting too much beer. Friends and family we’re happy with a nice carbonated beer. I would recommend this product good quality and value. Great piece, and easy to use. Works great!!! By far the best way to bottle home brew. Absolutely worth the purchase. I now have less exposure to oxygen and don't have to wait very long to carbonate. It works great. Took a few bottles to get used to it, but it works great. I was surprised that the relief valve has to be unscrewed close to the end (at one point I didn't realize how far I was going and it popped out), but after I got into a rhythm, it's worked great. I also got the accessory package that came with it. Slightly confused at first, but you literally cut your gas line and install the Tee. The gaskets that it comes with work great. No leaks, nothing. They snap together when needed. Biggest complaint is the pressure relief valve. To get it to work it has to be screwed out to the very last thread. Mine actually fell out and spring went MIA for about 10 minutes. Lighter spring would make it function much better. Stainless steel spring would be great. Fewer holes in the relief valve would be nice so you could direct the spray that occurs in 1 or 2 directions and not 4. Hose assembly diagram would have been helpful. Parts diagram would have been good. Had to fish out tiny o-rings from 5 gal bucket of Star-San. Beer side hose barb could be a little larger, sediment actually clogged it up. All in all, not sure it is worth the price. This is a good piece of kit for the home brewer who wants to bottle from Keg. I have room for just one keg in the beer fridge so bottling some while the keg is running perfect gives some in-between beers to enjoy after it kicks and the next keg is chilling/carbonating. Takes some practice and paying attention, need to fill to the right place to cap on foam but not too much to prevent spraying when removing stopper from bottle. A small inverted plastic cup sort of thing above the stopper might make a good spray shield. Also, if pulling a touch early to avoid the spray adding a little more beer to the bottom not under pressure (stopper raised slightly out of bottle) will bring the foam to the lip of the bottle but be careful to swing valve to beer not gas or you will get a foam volcano. dont ask me how I know this. Anyhow, for the price you cant build it sourcing new all stainless parts if you value your time at all and piecing it together it will have many more fittings and places that are hard to clean so just do yourself a favor and buy it if you are in the market for a counter pressure filler. While I like it for its stainless steel construction, the relief valve is somewhat of a pain and won't release until almost screwed all of the way out. Also, don't plan to use this device too much to fill up bombers or anything larger than a 12oz bottle. How have I not reviewed this yet? First borrowed a friends about 16 months ago and immediately fell in love. Bought mine and my only regret is not getting the deluxe kit. Far superior to all other bottle fillers I've used. Finally got it in the mail and started using it right away, its very hand and easy to use, great for quick bottle and growler fill ups! We all collect equipment and gizmos in our brewing journey. MoreBeers filler gave me a little bit of a learning curve but I caught on after a half a case of bottles. If you don't want oxidation in your bottled product, especially your precious barley wines, old ales,etc then I recommend you shell out a few dollars and start purging your bottles as you fill. Has never failed me. I had the choice between this and a Blichmann beer gun. I chose this because it seemed to make more sense. After hearing all the complaints from friends who bought the beer gun, I knew which one to buy. I also bought the "accessory kit" which necessarily increases the overall cost, but I think it's worth it. I can connect easily, maintain carbonation, and bottle off of my kegs for club meetings, trips, or competitions. It works as advertised, and has been doing well for me filling cases upon cases of bottles over the time that I've had it. There are no parts to lose or fall off inside the bottles. The one downside is that it doesn't really work with stubby bottles, because the metal "wand" is a fixed length and the rubber stopper won't slide down. That's a minor issue for me - I just don't use those types of bottles. This does a good job filling bottles, so long as everything is kept cold (including bottle), otherwise I've had foaming issues. I knocked a star off because its a little awkward to use compared to one-handed products (e.g. Blichman's). I found that creating a "filling station" whereby I put the empty chilled bottle into a sanitized bucket for filling, worked best, because I could set down and lean the filler inside the bucket to keep the drippings contained while I capped the bottle. Works well even for the larger 20oz bottles. I was going to build one of these myself...but it wasn't worth it after I priced the individual components (in stainless steel). Great price for a great tool. This makes filling a bottle so much easier. The ability to purge the oxygen out of the bottle is invaluable. Watch the video on this product. You can beat the price and the valuable use of this tool. This is better than the Blichmann beer gun which cannot purge oxygen. I just received my bottle filler this week. First time I used it I was not getting any flow. You have to thread the relief valve way out to get the beer flow going. Buy the accessory kit. Once I finally got the process flow figured out it worked great. I own two of these, great quality filler for the price. All stainless except the spring in the check valve which starts to corrode if left in PBW too long. Spring is not that strong either. I recommed replacing the spring with a stainless one. I also recommed placing a stainless fender washer above the rubber stopper to get even pressure on top of it when filling. Gas and beer both fill from the bottom. Filler works great, I am usually able to fill bottles with little to no foam/wasted beer. This bottle filler takes a few times to get the hang of. Once you have it dialed in, filling bottles is pretty easy. Yes the spring isn't stainless but since it's on the overflow valve it doesn't' really matter. Like Darren, I spent some time researching other counter pressure fillers including several DIY solutions. None satisfied my criteria because of materials (plastics and brass) or were bulkier and lacked a proper pressure/liquid release value (DIY). First thing I did upon receiving this unit was to disassemble and clean it, then reassemble, tighten all connections and pressure test it (CO2 & water). Just filled my first batch and the filler worked perfect with no foaming issues which reduced my wasted beer to no more than an oz from a 5 gal keg. Using both the 3 way and pressure release valves, I was able to control the flow of beer to the point that I could fill each bottle accurately to the same level each time and had no leak issues. My next step will be to make a stand to hold the filler so that I can handle the bottles more quickly without concern of them falling over or contaminating the filler by placing on an unclean surface. Also I would like to replace the line fittings with easy to detach units to make disassembly and cleaning easier. One word of caution, make sure to check your CO2 pressures so that it does not cause a back flow into your keg. Also I suggest to check all of your connections and posts because this will quickly show if you have any worn parts on your kegs. I opted for this CPF over others because of the materials they are made from or the DIY route which would have been more expensive and time consuming shopping for all of the parts. I have not encountered any issues with the quality of the parts as others have mentioned or problems with components, then again I immediately disassembled, cleaned, reassembled and tested the unit before actually using it with my beer. So far I have had zero issues and only changes I would consider making are replacing the hose connections with quick disconnects to ease disassembly and cleaning. Otherwise, this filler worked flawlessly for me, filled bottles accurately and minimized waste due to foaming (no more than 1 oz out of 5 gal lost). Highly recommend this unit, but make sure to check that all parts are tight and to play with your CO2 pressure settings (I worked at 5 psi). Anything higher showed failing seals or loose connections on my keg and lines. I've put this one into the sour side of my brewing equipment. It's not as easy to use or clean as the Blichmann Beer Gun. My CPBF also has an odd gas leak when you use the ball valve in one direction - when you swap the direction is does work fine. I've marked it so I'm always using it in a certain way. I still have yet to get the pressure right. I am thinking about icing the keg and increasing the pressure, along with icing the bottles to keep as much gas in solution as possible. another tool in my brew chest. Works well. A bit messy but still a good idea. I was going to buy the beer gun but then I got a decent price on this so I bought one anyway. Time will tell if it was worth it or not. After I use it a few times I will follow up. It looks like it is all stainless. I just hope it isn't a pain to clean. I used a friends and knew I had to buy one for myself. This product is easy to use and designed well. I recommend this specific counter-pressure filler to my friends. 1. The 3-way valve does not completely close. It leaks either beer or gas in the closed position. I remedy this by moving the valve to the gas position and closing the inline valve from my CO2 tank on each fill. 2. The stopper ends up getting pushed up the stem and needs to be pushed back down every few bottles. 3. 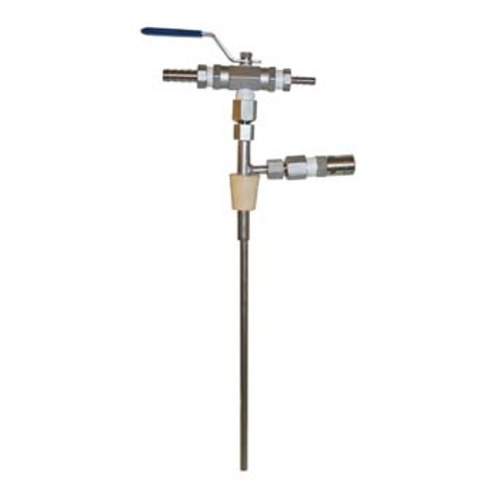 The pressure relief valve is hard to adjust accurately. When trying to open slowly, it sticks then opens beyond where I want. Also,the spring is not stainless and will rust if not disassembled and dried immediately after each use. Agree to all to all of the above. I purchased 6 of these for a small commercial cidery. We ultimately filled ~150 750 mL bottles but could use only 3 of the fillers successfully. The other 3 either leaked through the handle connection or continued to leak either cider or CO2 when in the middle "off" position. Additionally the pressure release valves did not operate at the same spring-constant and/or relief pressure from bottle to bottle. We will be keeping the tubing section (even though the welds are questionable) and will replace the valves. I realize that this is a very specific item with a small market, but for $70 the quality is simply not there. This review is spot on. I ran into exactly the same issues when I tried bottling with it. I thought the same thing about too. Had I not placed an additional inline gas valve upstream, I wouldn't have been able to bottle anything at all; If you let the valve leak on the fluid side, you agitate the beer as you remove the filler, generating foam; If you allow it to leak on the gas side, you'll shoot beer skyward. I'm trying to get my money back on this now. Try as soon as you buy. This is a great product and is built to last. The only problem I had is a little bad luck. Despite only using 6-8 lbs of CO2, the 3 way valve that came with my CPBF doesn't want to seal tight in the neutral position. Basically foam or gas is leaking depending on which side of the pseudo neutral position the lever is on. Suffice to say, I took more than one beer bath trying to find a happy medium. When you do purchase this product, don?t wait 6 months to find out if there are any flaws with it. I did expect to use it sooner than that, but draft homebrew is so good. Once you get the hang of the work flow of filling with this bottler, it's easy to knock out a five gallon batch. Every problem I've had with this piece is due to "operator error" and NOT equipment problems. Normally, I would have built one of these units on my own. However, due to time constraints, etc. it bought this one instead. While I still prefer the DIY approach, I'm very glad I both this piece of equipment! No problems with freezing. No Vesuvius blow outs (except when I forgot to turn the tap to a neutral position before lifting the filler out of a bottle - beer shower). Just a great piece of equipment. Well made. Well designed. I have both the beer gun and this MoreBeer CPF. Hands down my experience with the CPF has been superior to my results with the beer gun. This is especially true if you are trying to bottle something with a little higher carbonation level. Keeping the beer under pressure while filling makes the job so easy. This CPF has as a nice feature in the single control valve to switch between beer and C02 rather than others that have two valves to set independently. This is a great tool to have if you want to bottle a couple bottles and not a whole batch. It took me a while to actually get the hang of using this but once you do it's awesome! A couple tips for using this is 1, make sure you watch the video on this site, it does help and 2, keep the keg cold and also freeze the bottles before filling them up. If you keg your own brew, I recommend this handy tool! This filler works great. It takes a bit of trial and error to get the hang of things, but once you do it's great. The only issue is the cleaning of the thing. I have gotten in the habit of taking it completely apart and cleaning it after each use. I haven't been able to find a way to adequately clean it assembled. As for the spring some have mentioned, I replaced it with a stainless spring for $1.50. While this is a good product and does exactly what it claims to, it requires some amount of thought and a fair amount of time to use. About 38 to 45 min to fill a case of bottles. It also needs more cleaning than a casual rinse. I had to adapt to my system, but that is pretty much how all homebrew things work. I'm able to quickly and easily fill bottles off my kegs and have recommended this filler to my friends. takes a little getting used to, sprays a bit from the regulator, but works very well. Bottling is a pain, but this CP filler does an excellent job once you dial in your usage. I find that its quite easy to use when I bottle alone. After the first bottle full, you should basically have it dialed in for the rest. Also, every beer i've bottled with this CP filler has kept excellent carbonation levels as long as they were carbonated well in the keg beforehand. One word of caution, be careful not to let the stopper drop in the bottle by pressing too hard. I have this product and the Blichmann beer gun. I used the Blichmannn many times before purchasing this one as i wanted a counter pressure filler. Once you get the hang of it, it works well. Thanks for a great product!!! Have both, Beer gun given as gift after I purchased counter fill. There is a learning curve to it. Once you set CO2 pressure, filling is a breeze, no foam, no loss of carbonation. I use counter pressure fill over beer gun. I use this filler all of the time, even for filling growlers. Works well. I also use it for Co2 flushing, to prevent oxidization. There might be a better tool for flushing, but this works great. at how well this worked and easy it was to use.I recommend that you watch the video a few times to see how things are done.I have less waste using this vs a growler filler. Once you get the hang of this bottle filler, it works pretty well. The video post on the website was a big help for set up and getting off on the right foot. The stopper ends up getting pushed up the stem when inserting it into the bottles (I'm sure I don't have to push that hard) which adds to some "cumbersome-ness" but like I said, works pretty well for my purposes. Great once you get a rhythm. You wouldn't want to break this out to fill one bottle, it's a little cumbersome with all the lines and such. Once you get going, especially with someone to feed you bottles, it becomes a little machine. bottled beer seem to hold up very well, too which is the important thing. Bottle filler takes a little practice to get good at it and can be very messy. The 3-way valve leaks a little beer in the closed position. The spring in the pressure relief valve is not stainless and will rust if not disassemble after use. Also, the beer must also be very cold in order to get good carbonation. On the plus side, you can fill a lot of bottles in short period of time. this is a good filler that is a true counter pressure filler. the blichmann beer gun is not. there is definitely a learning curve but once you get the hang of it its a piece of cake. watch the video a few times before you do it. the previous post is correct that the spring will rust if you leave it wet and you should dry it off or blow it out with the air compressor after your done. I switched to beer gun now as it's easier to use, you get what you pay anyway. beer gun is so much easier to use then this. Got this used from a local brewer. This makes bottle filling a much more enjoyable experience. I would recommend grabbing more stoppers to fill different sized vessels. Make sure your beer is cold before attempting to bottle. Good bottle filler. But spring in the pressure relief valve is not stainless and rusts. Like other reviewers have said, this works great once you get the hang of it. To get the best results, fill when the beer is very cold and place the keg up higher than where you are filling. The spring that is used in the valve to release pressure is NOT STAINLESS. Mine rusts and I'm always having to scrub the rust off of it. Love this bottle filler. No more flat bottles of beer for my friends! I just attach this to my keg and voila, force-carbed beer in bottles.